The idea is you copy and past this list (in your own blog or in the comments section here!) and bold the items you've tried. I've eaten strange things, (not on this list) and some common place stuff on this list (like spam) have never crossed my lips! Not on the this list, but on my list are things I have eaten are: boar, ackee, several kinds of roe, (not just caviar), limburger cheese (an other quite aromatic cheese) kelp, carageen (and other sea weeds),red palm oil, falafal, and many other odd foods--most are not part of my regular diet, but, I have learned to at least taste/try things--thought some many foods remain on my "I'll eat, but never cook" list. I had a wonderful time this weekend, visiting with friends old and new, in Catskills.. I even got a bit of knitting done! 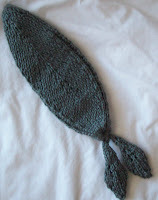 First I took a spare needle and knit the ‘pocket flap’ using the solid turquoise yarn. 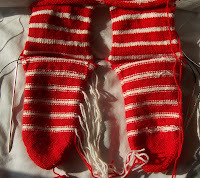 I continued then knitting the pocket stitches, (6) and slipping unknit sock stitches onto the waste yarn. This is what the sock looked like at that point. Since then I’ve knit some 3 or so inches of “leg” and an inch of cuff. Another few rows, and I’ll be binding off the cuff. The pocket will be finished by sewing the flap to the inside of the sock. and sewing on a button. Teabird made a post today about libraries…This post is a comment on her post--made here, because it was too long really for a comment! I didn’t really read (or I don’t remember really reading) before school. I read words, (Stop, Webster (Ave) Milk, etc) but not sentences. I might have stumbled too, with sentences till about 2nd grade, when I clearly remember READING. She set an example, and took us to the library, (and let us take books out) but I don’t remember her reading the books (for us/to us). And poverty meant few books in the house --one 3 foot wide, 3 foot high book shelf was sufficient to hold all the families books for most of my childhood. Enter on Bainbridge Ave., and you entered the Main reading lending section and the main floor—stacks and stacks of adult reading, plus the second floor –up a grand stone staircase--a full floor of childrens and young adults books. The glory of this system was kids were free to make noise (not too much, but some!) –making the library an inviting place—since a whole floor separated us from adults seeking a quite place to read in a noisy city. I suspect I was plopped down in reading programs, while my mother explored downstairs... There were, in those days, several librarians—or perhaps just 1 and several assistants—but there was always someone behind the desk to check in and out books, and someone on the ‘floor’ to help you find books. Going to the library was a weekly (if not more often) event in my childhood--it established a lifelong habit--one both my children share--and my grandchildren are learning. Some 20 years ago, I made a resolution to read less fiction –my goal: 1 non-fiction book for every 2 pieces of fiction. I’ve pretty much stuck to that resolution. My reading taste are eclectic—histories figure large, but I like to read math, too, and biography, too--doesn’t everybody? No, that’s wrong, it’s half a foot, half a foot, --and the foot we are talking about is not one third of yard, but a child’s 8 inch foot. Or some 4 inches-- It's quick work knitting a sock with just 48 stitches! 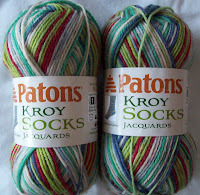 Toe up—starting with some left over 4 ply Kroy (Patons)—this is twice left over! 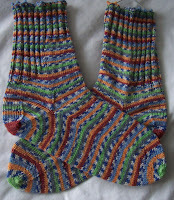 First from some striped socks, and then from some swirl socks. I used the magic cast (my newest favorite cast on). I thinks it is Cherry Tree Hill, but it could be something else-- Germania had knit it and frogged it, (and I never had a label). I made a pair of socks for myself out it—and had a lot left over--plenty for a pair of children’s socks. The yarn is super soft, (and should be knit with 1’s I think, but I am working on 2’s) the Kroy is a bit more durable—and I’ll use it again for the heel, (and maybe even for the pocket) –the colors are a bit off, (not as dark as this picture) The better image—colorwise—was blurry, and I was in a rush. I opted for a clearer, if not color perfect image. Sturdy heels and toes are a must of kids socks--and while turquoise and brown are the new favorite colors, and the hand painted yarn has both, it is a bit dark --and the Kroy brightens up the color while adding some strength where it will be neede most. I have plans for this weekend, so I don’t think they will be finished before the middle of next week--and for now, I am off to knit--if not a league or foot, at least a few rows. As a child, I wore a uniform to school. Most of my other clothes were home made. For the most part, my mother accommodated my (and my siblings) quirky requests. My DIL sews less (but then so do I now days!) but she is particular about the kids clothes. Still Miss B, like any child who has taste, quickly learned that one major advantage to home made clothes was the ability to request, (and be accommodated!) on details. These socks are for Miss B—and are lacking the one detail she requested—Pockets! Now pockets in socks might seem a strange idea to you (and me) but it’s what she wants, and she has learned, that if you ask, you are likely to receive! Moments ago, socks were just packed in a box (and the box was sealed, and addressed, and made ready to mail—and I am passing a post office today in my travels... so they will actually be mailed!) and I’ve already cast on for another pair of socks… socks with pockets. These socks were knit in last years favorite colors, (blue, green and purple) the New socks are going to be made in this years favorite colors, browns and turquoises. There are plans (but who knows if the plans will work out) to make a set of sweaters—One for Miss B, and one Master C—in brown, taupe, teal and turquoise. I suppose, now that I know these are favorite colors, I should get started on them. But first, socks with pockets! Somewhere, lost in the history, some knitter made a mistake and made a yarn over. They weren't the first to make this mistake, but they were the first to look at it, and say, Hey, this is cool—I've made a hole. Sometime after that, they figured out, that by pairing holes (YO's) and Knit together's, they could make lace like designs. Or is it the wrong size, the wrong gauge? Or just not something your really want to knit? Is it sitting in a frog pile.. or just stuffed in a bag, being ignored? Your mistake could be the best thing you've ever knit. I make mistakes all the time. Sometimes I frog them, more often I try to salvage them. Remember the secret project that I said you wouldn't be seeing for a while? 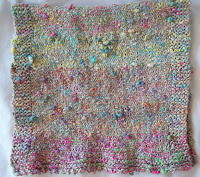 Well, it's back to the drawing board for me... (I had knit, and frogged 3 times before I got around to taking a photo, and a few rows later, I realized, I had, yet another “mistake” but this time I salvaged it. I didn't intend to knit this silly little hat, but I like it-- and this is a fine mistake—if you don't like it, you can Leaf me alone! It's not a hat for warmth, but for style--its a mistake that been redeemed! While rethinking what to do to get what I want (and I didn't want this little hat, for sure!) I've been weaving in some ends, and other wise finishing up a brainless project—a linen hand towel. When the weather gets cooler, I’m going to frog it…It's almost impossible to frog mohair when it’s warm, but cold mohair can be frogged. Freezing works, but the work warms up quickly –and it’s a stop and go process in the summer—in a few weeks, I can bundle up, sit outside and get it done quick as a wink. 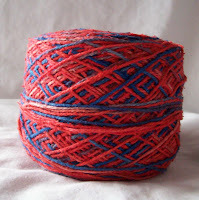 I have other silk—this red and blue, for example—This ball is 3oz, and I have 2 more this size, and almost the same amount knit up (not by me)that awaits frogging. I don’t really like the color way… and a few yards (100 or so) have been over dyed with a deep purple—I like these purples and plums better, but I am not sure if I want 10oz of purple silk.. 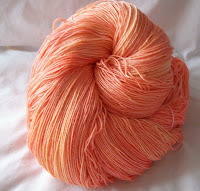 I am still thinking about the best way to over dye this yarn–and get a color that sends me! Of course, I still have a pocket (or 2!) to knit, but I don’t think that will take long. And then there’s this secret project I’m working on—it’s most definitely a work in progress—this is the 3rd attempt, and it may be frogged and worked again to get it just right. It’s a mystery project being knit with a mystery yarn-- a synthetic I think, but I could be wrong, the color is silvery dark grey—like silver with a dark patina—and it's super soft--pehaps even too soft for my purposes! When Yarn companies and big box craft stores work together to make you spend more money? Now, the price of these yarns are going up (many of them are made from petroleum by products) there are companies renowned for 'plastic yarn' who are now selling wools again! Coats & Clark's, for one. 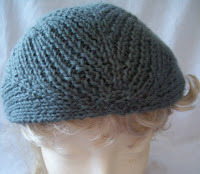 The first hat I ever knit was a 2 X 2 ribbed 'watch cap'--in grey Red Heart wool. I gave it to my father, and he, being the mensch he is, wore it. Now, I find I can go into ACMoore, or Michaels or JoAnnes, (the 3 big chains that have stores in the NY/LI area) and find several different wools, (or bamboos, or linens, or evens blends with silk!) 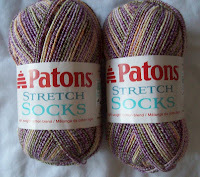 or nice wool and wool blend sock yarns like these Patons yarns! Sock Yarn is what jumped out and grabbed me--not just the Coats & Clark's sock yarn, but Patons sock yarns too! It comes in a nice range of colors, and in plain stripes or stripes with mock fair isle. It's a smooth, not too splitty yarn,--70/30 split of wool and nylon, with a really wonderful hand. I think it's the aloe—but it's a pleasure to knit... it jumps happily from needle to needle, and the socks grow by leaps and bounds. The stripes... well they are near stripes..
And I am working in 1 X 1 ribbing –which, I KNOW, uses more yarn per stitch than stocking knit...but with a 60 stitch sock, I am not getting complete rounds of stripe.. And I'm not just a stitch or 2 short.. but a quarter of round short! I don't think my granddaughter is going to care, (I do!) 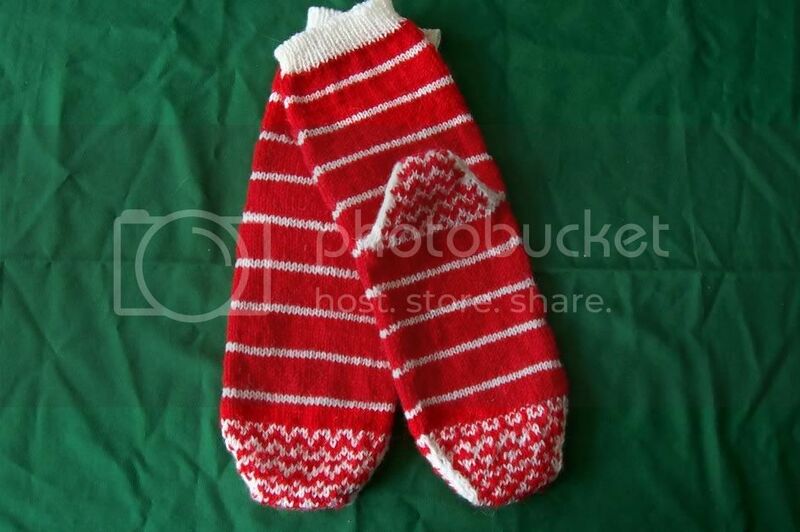 so these will be her socks.. They are pretty simple socks.. but she's requested socks with a pocket.. so I have to plan (and knit) a sock pocket--I think I'll just pick up some stitches from the fancy cast on (not that fancy really, just long tail variation and make a pocket of some sort--since she wasn't that specific! Afraid I was going to disappear from the blogosphere again? Well really, 6 days in a row of post was never my norm! I still have a half dozen more ends to weave in... but for all intents and purposes, the Rag Doll socks are complete. I still have lots of red (and white) yarn left...but.. I tend to like medium length socks.. I almost never wear high boots (lets face it, i haven't owned a pair of high boots in 20 years.. and I am not likely to buy them now!) so I don't need “boot high” socks. I just don't much like knee high socks--(I do sometimes were knee high nylons.) I don't think I've owned (bought or knit) a pair of knee high socks in 40 years. So there is no way I am going to start now. My “normal" socks are—when the sock is folded at the heel, about as long as the foot. These RagDoll socks are about 1 inch longer. 1—I made NO ATTEMPT to make the color changes jog-less. 2—The heel is yet another experimental effort.. It looks a bit strange, but its fits great! I might repeat this basic design(hardly an original!) and try to get it to look nicer. These creates over 1.25 inches of ease at the heel. 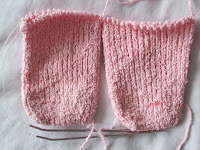 (stitch gauge was 7.5 Per inch) And corresponding gussets where I decreased after the heel –bringing the stitch count back to original number. 3—The gussets were on the sole, not on the instep. I frequently add gussets on this type of heel, but usually I add them on the instep. The extra stitches made the heel significantly deeper, and shorter. And left a large number of stitches at the completion. Normally, when I make an afterthought heel like this, I decrease till the heel is deep enough—and by then, I have anywhere from 16 to 22 stitches left. When this heel was comfortaby deep I had 40 stitches remaining. (I started the heel with 80 stitches—60 from basic sock (30 +30) and the 10 gussets stitches (10 +10)) The final 40 stitches were grafted. 4—Did you notice the kitchenered/tubular cast off? A nice touch I think.. I have, huge shapely calf muscles.. and even an inch longer sock makes a big difference—the tubular cast off is a stretchier one. And make these ever so slightly longer socks fit comfortably. All in all, I am very happy with this sock..
No make that 2 legs and foot up on finishing.. Note the advantage of having the heel stitches on needles--the foot of the sock can be easily turned inside out for finishing work! And that was last night! Now the second foot is 'finished'(that is no more tails!) , and the 6th stripe repeat is on its way--Just one more round to complete it! I've planned an 'interesting heel' –it works fine when I knit it in my head.. what awaits is to see if my fingers can do the same! 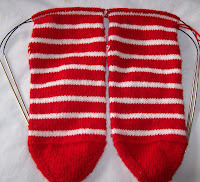 The Rag Doll socks are coming along—I completed another stripe pattern repeat... And then got bored—so instead of knitting, I removed the waste yarn and have positioned the heel stitches on needles . I could do this, because I finished the Pink Ped's--(and freed up a pair of needles!) --and I wanted to do this, because I plan to knit the heels of the Rag Doll socks --before I finish the legs--then finish up the legs until I run out of yarn. Today, I might busy my self with weaving in some of the ends –I've carried the red yarn, but cut the white--2 tails per stripe, 11 stripes so far, 22 ends per sock! That's a lot of weaving in to do! And there will still be more ends as knit the heels and finish up the legs. 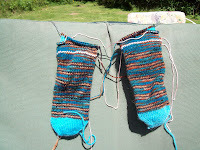 I find doing some of the finishing before completing (be it a sock or anything!) works for me—I feel as if I really have made progress when the ends have been woven in.. And I love taking a sock off the needles and being able to finish them up in a few minutes. 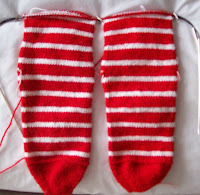 Still—even though my socks (even striped ones like this) are complete almost immediately after they come off the needles—what with taking time out to do finishing before they are finished--I tend to let them 'ferment'--I almost never wear a completed pair immediately. I like to be able to hold them, admire them, enjoy them—before the become just another article of clothing! As the knitters in my LIC knitting group found themselves with 10 or more skeins in shades of green, I grabbed the bag filled with single balls and left over skeins. Ok, don't go thinking I was totally self sacrificing or anything---I got some 8 balls of an Anny Blatt wool mohair blend! And I got some other really nice stuff--this scarf was made from a half dozen partial skeins in that bag-- and its 100% silk! Getting back to the Pink Ped's –a terry cloth like cotton yarn with a bit of spandex—the Peds were knit toe up, working from both ends of the ball—until there was nothing left (the tails after casting off were shorter than 6 inches! )they are a bit short in the back.. but they work. Not much of sock—but good enough for keeping my feet comfortable as I walk back from the pool to my apartment.. 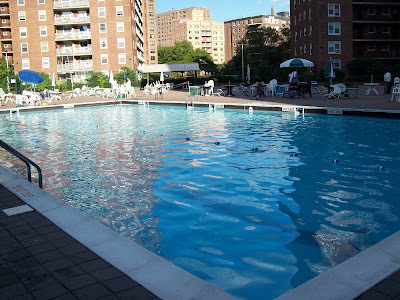 Speaking of the pool.---Looks good doesn't it? Looks big, too! It' not a luxury pool club –Just a close by, convenient place to cool off.. And by closing time, cast in the shadow of the surrounding tall building! Frequently, on knitting BB's or other sites, (like Ravelry)--when a new knitter asks about color work in knitting, I recommend Stripes as a first option—even though I know, stripes aren't as easy as they seem. There are several elements that go into stripe patterns; Contrast (or lack of contrast) width of stripe(s) the number of colors and regularity (or lack there of!) . I use a lot of self striping sock yarn—and the resulting socks are not always as successful—at least not to my æsthetic! Here are some stripe patterns/colors I like--the first is a self stripe Regia, the second stripes I designed--the pattern in each case is very similar--an oblique twisted rib. and here are some I don't like--low contrast, and narrow stripes just do anything for me. the color ways—I tend to like High contrast, but I also like shade of monochrome. But I also sometimes make stripes of my own, using (or using up!) several balls of yarn. The size of the stripes (narrow vs. broad) and the balance-(different sizes of stripes vs all stripes the same size) and colors—the number (of colors) , the levels of contrast (high vs. low, shades (of the same color) vs. color ways ) and the regularity of the pattern (I like regular patterns—Way more than random ones...all go into creating a interesting stripe pattern. 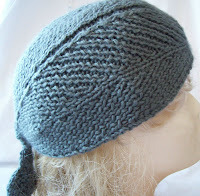 Stripes mechanically might be easy to knit.. but good striping patterns can be difficult!. These elements are general make for a good stripe pattern. There is another element of stripe.. In times past, striped clothing was a sign of criminal behavior.. Convicts were required to wear stripes.. (and they still do in cartoons of all sorts!) --Stripes do have an element of outlandishness. Finally, another pair of summer (croc socks) --will they be finished before the season is over? Well there is a hope... Goodness knows its nice to have some cottony socks to wear inside my croc's--(my standard pool side footware). or a 1000-- does it matter? I know those who have seen me, been with me in the past month, will express some surprise –I haven't seen that down, or that negative.. but that because I've been using them (and their up beat moods) to elevate my own mood. But on my own, its been difficult to be upbeat.. Truth is, the is no excuse—or a thousand. I seem to be on the move—and feeling less glum. And while I did take a vacation from knitting, I haven't been total idle. For one, I have been channeling Sulu –and have 24 pairs of earing's and almost as many necklaces to prove it.. Of course her's are for sale..(mine aren't)--This collections of 5 pairs is going (gone !) to my daughter. I'll get around to photographing the ones I've keep for my self soon. And I've died a few skeins of wool (and silk)--haven't knit them, but I have dyed! 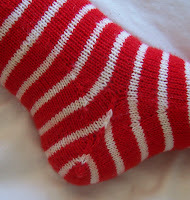 Along with a few members of my LICKnits group, I am a member of a Red sock KAL. My new red sock are not quite the same.. but similar...a bit more Rag Doll socks..
Maybe a photo tomorrow.. or soon.